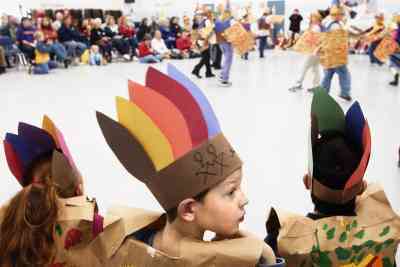 By Thom NickelsWearing Native American headdresses used to be a rite of passage for most American boys. My childhood Boy Scout troop, for instance, had many halo and straight-up Native war bonnets that we wore during Scout Jamborees in Maryland along the Mason-Dixon line. Dressed up, we built campfires, put on war paint, and hunted one another down in a great Native American fantasy that usually ended in a great bonfire and a circle dance. (Today, a bonfire would be outlawed as "dangerous" and war paint as "unacceptable.") Such ceremonies taught us to be respectful and to honor the American Indian. These rituals were the high point of camp life, so much so that for the longest time I wanted to be an American Indian. Pretending I was American Indian was such an intense childhood obsession I'd take my bow and arrow, spear and halo war bonnet and lead charges against my faux cowboy or Calvary friends on the steep hills behind my house in Chester County. I didn't care that I was the only kid playing the part of an Indian because I saw the American Indian as a scared underdog in an unjust war with the land-stealing Calvary. Sorry, but I am totally out of sympathy with your complaint, starting from the first sentence in which you decry "political correctness" with the pathetic cliche about a "warpath." This is not about your fond memories of pretending to be another race. For us (I am Native), headdresses are not costume pieces or decorations. They are holy. They indicate achievements and reverence akin to wearing a priest's stole--you don't simply put on a fake one and go play. For you to describe our ceremonial lives as mere "inconsequential minutiae" is PRECISELY the attitude of arrogance and cultural bigotry that makes our protectiveness necessary. The fact that you have a history of behaving in such ways is not a validation of the history, any more than the legacy of blackface is a defense of that. It's a shame that you've attached such nostalgia to bigotry as a rite of passage, but that's what makes this our problem. American Indian people: "We find it offensive when you dress up as caricatures of us." Thom Nickels: "We do it to honor you! You're being oversensitive! We're not gonna stop!" Clarification: Thom, you cannot honor somebody by doing something they find offensive. When somebody tells you they find something offensive, you can either ignore them, which is in your rights but disrespectful, or you can be respectful and comply with their wishes. You cannot honor somebody by being disrespectful. This is not hard. The fact that you can write this many words about this topic and not stumble upon this simple fact is pretty impressive, though. My father used to “play Indian” as a child too. The only problem was, he always wanted to be the “cowboy” which was ironic because we are Oneida/6 Nations People. He told me this was because the cowboys always won and the Indians always lost. Westerns were big (in the '50s) and of course, little kids emulated those stereotypes in play. The white kids in the neighbourhood thought it was great they had “real” Indians to chase and terrorize. You see the difference between us is that when you are done playing Indian you can take off the headdress. We cannot. We are stuck with dealing all those stereotypes you have created for us, good or bad, and we are the ones who have to live with them. Seems much of the time I see people complaining about 'political correctness' they are complaining about being called out for demeaning other cultures, race or ethnicity. I find it interesting that you claim wearing a headdress as a rite of passage for your youth, totally oblivious to the rites of passage of the people you supposedly honor with such portrayals in your appropriation. Claiming it is just as much yours as the people who still use the traditions because you played with their culture, religion and traditions as a toy when you were a kid only shows the lowly stance you hold these people and their culture. It is a kids' toy to you, a romanticized idea or a source of amusement. It means something different to those who you claim are being overly sensitive and you refuse to acknowledge their side but insinuate they should accept yours as theirs. You state you wanted to be a Native American is if it were a job or simply a lifestyle, have you ever played Mexican or black? Instead of warpaint you can wear black-face and you can pretend to fight against slavery or something, why not? You are willingly ignorant to the other side of the story or to actually put some context into your actions. You are too busy in a mock defense of your right to speech, freedom etc. to realize your actions do not protect you from the consequences of your freedoms you choose to exercise. What you and all those children were respecting, Thom, is a clownish caricature of Native culture. You know, the savagery of primitive people whooping and dancing and committing other acts of wild abandon. That's not what Native cultures were like. You were not respecting real Native cultures--either those that existed then or those that exist now. If you were, you'd be volunteering on a reservation, supporting Idle No More, or writing pro-Indian columns. I'm guessing your "childhood obsession" hasn't translated into any of these actions. Respecting a caricature of Indians is exactly like respecting blacks by supporting minstrel shows, Aunt Jemima, and Amos 'n' Andy. Do you consider those fair and honorable representations of blacks? If there's a difference, explain it to us, because I don't see it. Nickels's closing argument is worth noting too. He tries to shift gears radically and ends up proving his critics' point:Two years ago, a male acquaintance of mine dressed up as a 19th-century Turkish sultan for a Halloween ball. He was walking with friends across North Broad Street when he was attacked by another man who said he was insulting Islam. My friend was beaten pretty badly and spent a day in the hospital. Now, dressing up as a 19th-century Turkish sultan is something straight out of an MGM movie set. A costume like that, to the modern mind, has a storybook quality with only a vague connection to Islam. Yet somebody was outraged and took matters into their own hands. What exactly is the point of your Turkish sultan anecdote? First you say you had a deep childhood reverence for Native cultures. As demonstrated by your cartoonish costumes and mock savagery, presumably. Then you say your "Turkish" acquaintance, and by implication the costumed Mummers, had only "a vague connection" to reality. In other words, these people were falsifying an ethnic group, not honoring it. Which is it? Were the Mummers trying to "honor" Indians the way you supposedly did in childhood? If so, why did they wear phony costumes only vaguely connected to reality? Or were they and you stereotyping Indians because you were too ignorant to know any better? If so, why did you expect to get a pass for your belittling behavior? For more on the subject, see Racist "Make Me Indian" App and Halloween = "Socially Acceptable Racism." Below: Kids who probably think about Indians the way Nickels did. The following article appeared online a few hours after I posted my commentary. Either great minds think alike or Indian Country Today is following Newspaper Rock. Or both.